Nothing cheers Inchcock up like feeding his mallards and pigeons! Sad innit? I kept waking up shivering, increased the heating, put extra togs on. Little Inch inflamed and sore but no blood again… looking good? Gave up trying to kip. Started the laptop and went down and made a cuppa and get me medications ready for later. 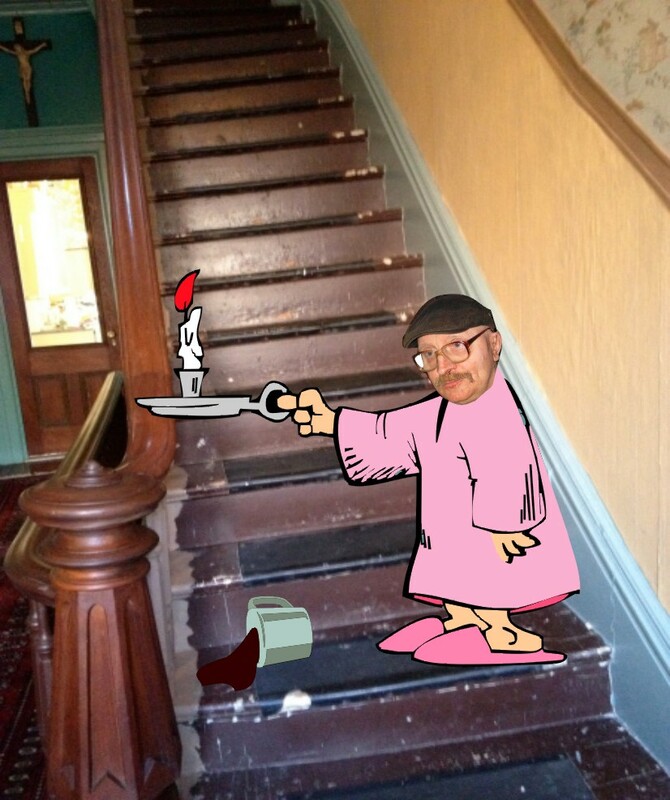 A dizzy-spell caused me to spill the tea on me way upstairs – went down and made another mug of char. Got into the interneting and forgot about me mug of tea as it grew steadily colder – Humph! I had a peek outside – freezing fog… -1.5ºc (29.3ºf), still it’s better than many places like America with their abundant snow in places? Flippin’ cold again now -2c and misty with it. Still, this is a tad higher than yesterday. Got missen cleansed shaved and well wrapped up. I got the laundry togs ready, and hoping I’d not forgot anything set off to walk to the launderette. I’d remembered the money for the machines, balls for the drier, fabric softener and book to read – but had forgotten the soap tablets. Hey-ho. Struggled back to the hoppit with the bags and put togs away… well dropped the bags in the bedroom. Decided on a walk into town to look at laptops, DVD players, Microwaves and get a woolly hat. Then remembered I hadn’t got a valid card to use to pay for anything. 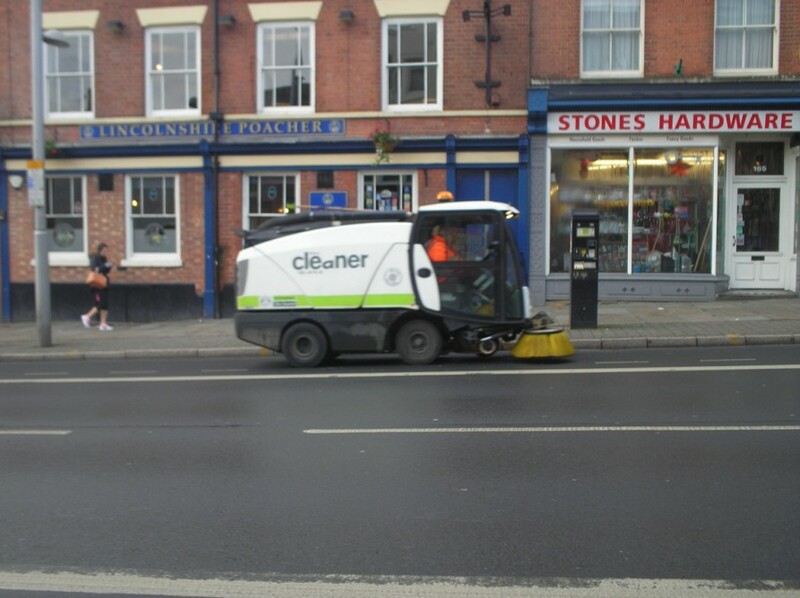 As I walked into town I noticed one of the Nottingham Council’s electric powered road sweepers and took a photo of it. As I passed the Continental food shop where they sell the high volume beer, there were two winos trying to have a fight with each other, plenty of swearing and gesticulations going on, but I think the alcohol had limited their ability to hit any target. They mutually agreed to sit in the floor and put their arm around each other? 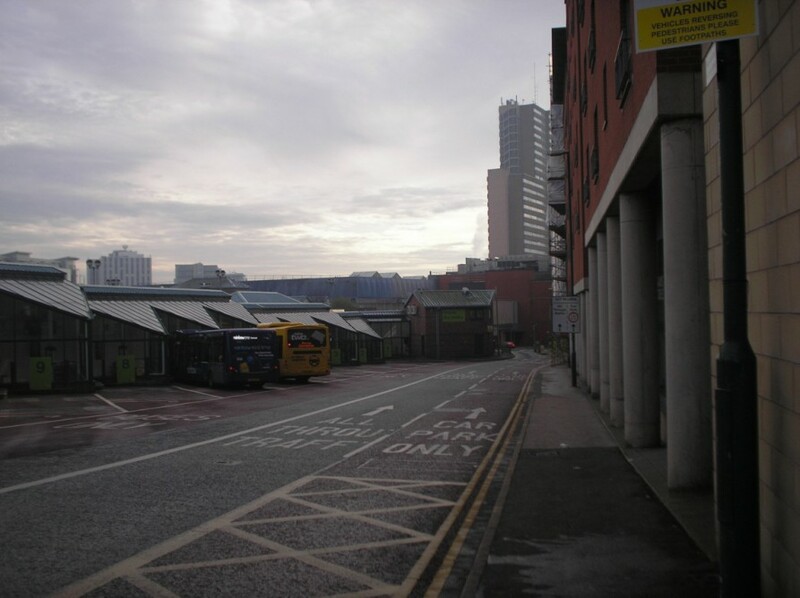 As I passed the Victoria bus station I took a photo of the flats and sky – it looked amazing to my eye, but it didn’t seem to come out like I recall it being. Further down Mansfield Road a chap was sat in a doorway with his scruffy little dog and I caught sight of the bottle of Whisky under the dogs blanket… Mmmm? 1) The Ostrich Burger stall with the helter-skelter in the background, with the man and woman on the right of the frame showing her giving him some vocals and you can see his reaction in his face I think? 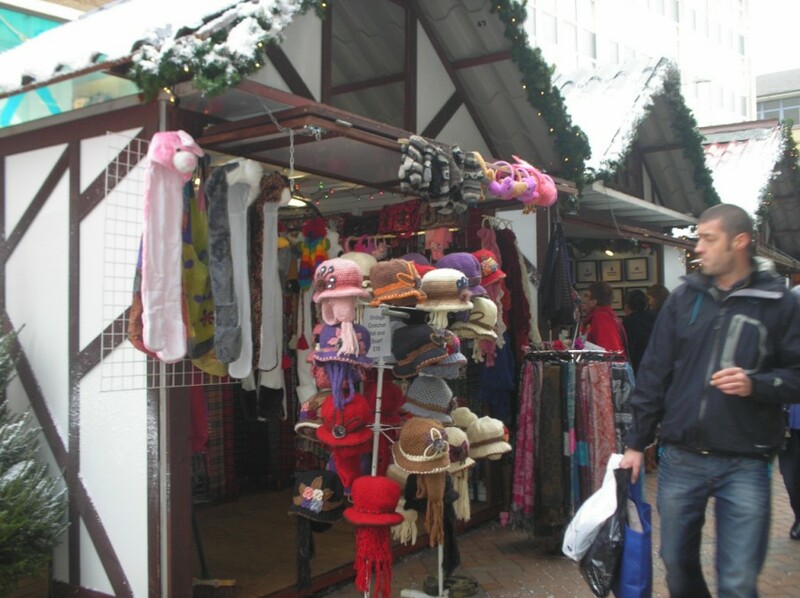 2) A little further along passing the stalls I came across one selling ladies wool-knitted headwear… Crochet Hat and Scarves for a tenner (£10) each. I liked the style of these indeed and took the photo to show the TFZ gals and see what they thought about them. They reminded me of something or someone, but I can’t remember what exactly. Film? Film-star? Book? 3) A short distance further on and I whipped it out again… the camera I mean. 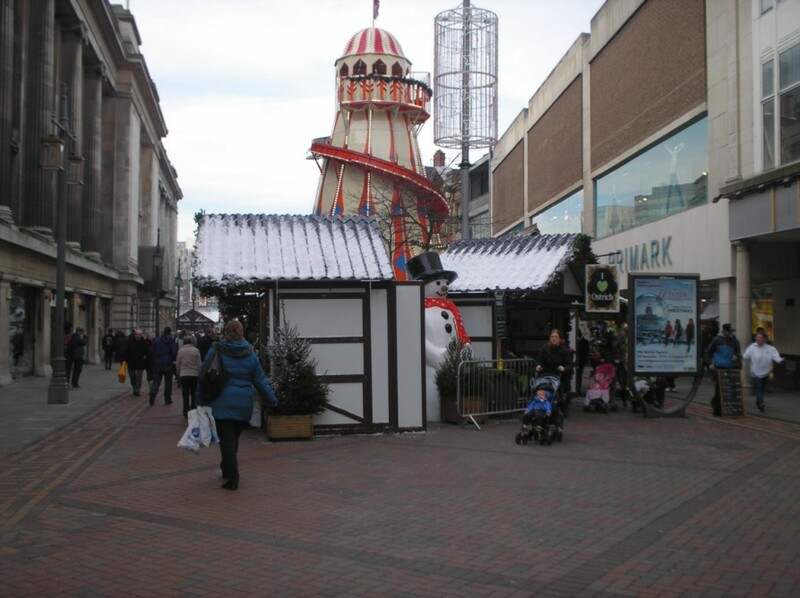 A food stall selling Minted Lamb, Roast Turkey, Wild Boar Burgers, Venison Burgers, Pigs in Blankets and Ostrich Steaks etc. I couldn’t see any of the prices, but there was no one buying owt at the stall. 4) As I crossed into the Slab Square and walked through the highly priced stalls selling stuff from all over the world – in the centre of all these stalls were a few children’s fair rides. 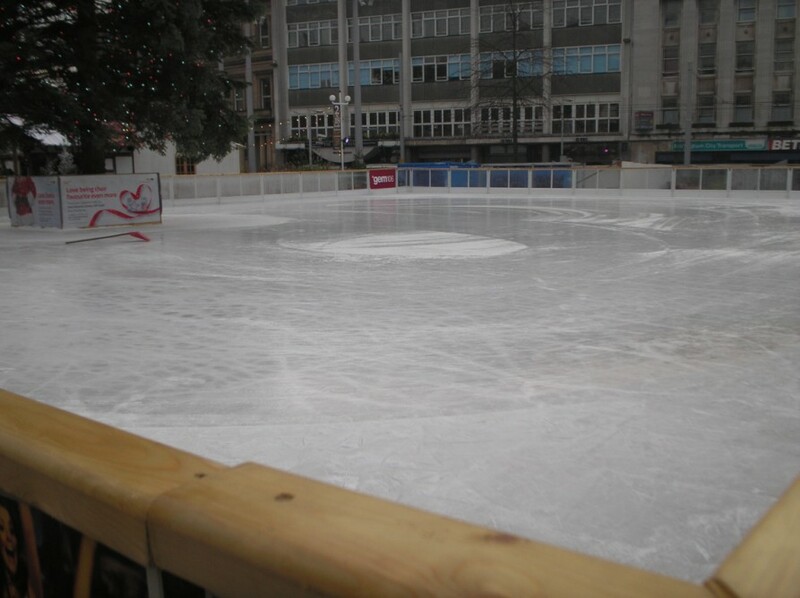 And they were putting the final touches to the ice-skating rink! Unfortunately it wasn’t yet open for business – or else I would have had a bash and skated a few rapid circuits yer know. So onward to the tram stop and caught one (Tram not stop) into Bulwell. The ticket checker woke me up asking to see me travel-pass, and he checked it on his machine to make sure that I’d swiped it like we have to now before getting on the tram. 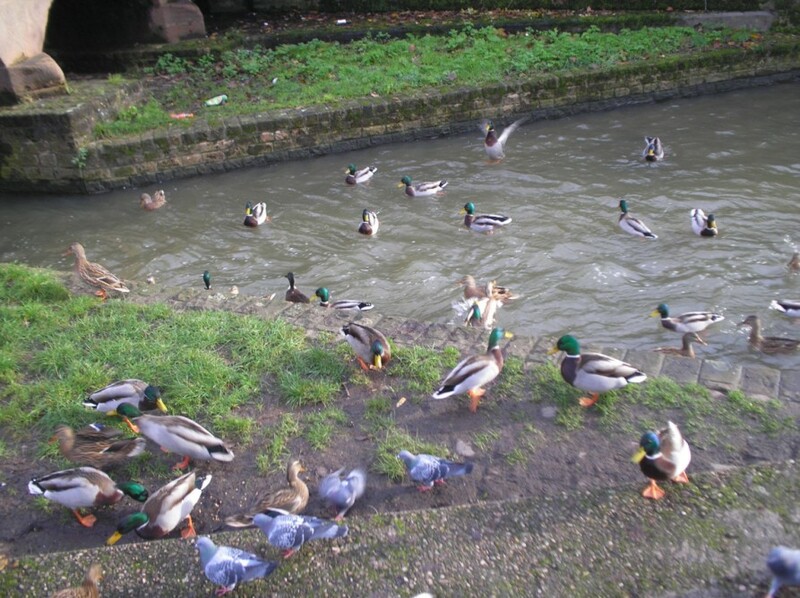 Still the threatening rain held off as I alighted the tram and made for the river to feed me Mallard ducks and pigeons. 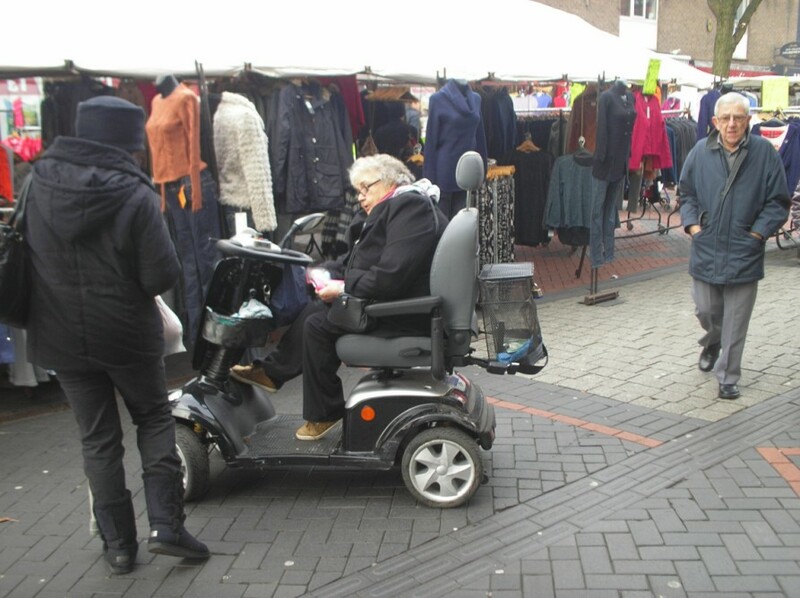 Bulwell market was quite busy for a change… pickpockets delight that place. I nipped into Fultons Food shop and bought another pack of the microwave sausages for when I get another microwave oven and some Marmite bread sticks… short dated but only 15p a packet. As I came out of the shop and walked across the way, I was just in time to see a woman on a mobility scooter sat talking to another younger lady and the scooter shot backwards and she panicked and lost control a bit. Luckily she did not hit anyone, but the thing that amused me was the way she just carried on talking to the other woman as if nothing happened afterwards. She scattered a few pedestrians! I plodded to the bus-stop to get one back to Carrington. Got in, WC, made a cuppa and some sandwiches then read me book for a while. 1730hrs: Tended little ‘Inch’- no bleeding at all! Made cuppa and took me medications.